Last week I was catching up on some of my favorite blogs and came across a gorgeous patriotic tablecloth that was made entirely out of bandanas by Kendra at My Insanity - please check out the pics on her blog. 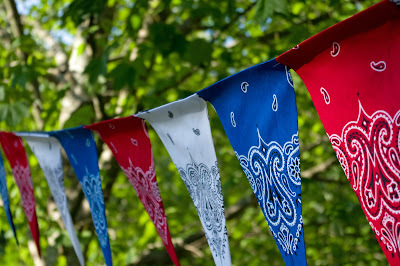 For two days straight I literally could not get the idea of using those red, white and blue bandanas out of my head. 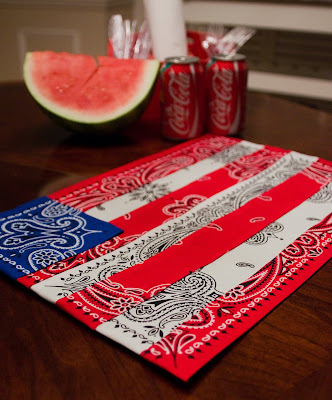 So on day three I finally decided to try making some other 4th of July decorations inspired by the tablecloth. I thought it would be fun to make a placemat using the bandanas, so I cut them up and put them back together to look like...a flag, of course! (1) cut up the bandana into four squares, (2) fold each square into a triangle and iron to get nice creases, (3) attach the triangles to a ribbon and hang. Kendra - thanks again for inspiring me to create these projects! Love them! Especially the bandana banner. So glad I could help spark your creativity! These are great! Kendra - Glad you had a chance to complete your tablecloth (it looks awesome)...I wish I knew how to sew! Purple Pug - Thanks for stopping by! I stumbled across your blog a few weeks ago and knew right away that I had to bookmark it...great stuff!! Love the banner! How did you attach the bandanas to the ribbon? Because I don't have a clue how to sew, I instead attached the bandanas using hot glue. And a year later, the banner still looks great - it's actually hanging in my kitchen now. love your post! The flag placemat is genius and came out so nice! Definitely will share with my readers for the 4th! Love the bandana banner! However when I followed your instructions by cutting and folding I did not together the same shape as yours. How did you get a pennant shape from a square? especially the bandana banner... but i am clueless as to how you folded a triangle from a square of the bandana... is that what you posted in your directions? How did you fold the square into a triangle? 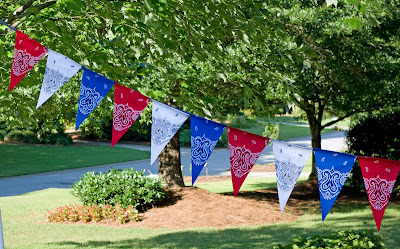 There’s no way to get that pennant shape from folding a square.